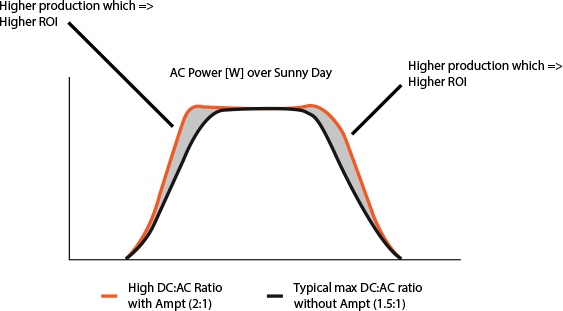 Ampt Optimizers offer simple and low-cost ways to upgrade your existing PV systems to produce more energy. Recover energy lost from mismatch and degradation to increase production. 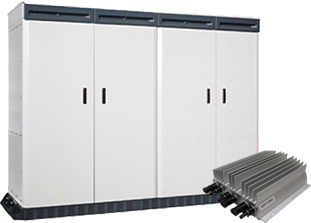 Use newer and lower cost per watt inverters while improving overall system performance. Mix new and legacy modules without overloading inverter to increase revenue. Leverage an Ampt optimized array to save on storage. Ampt’s low-cost, simple-to-install solution recovers energy lost from mismatch to provide exceptional ROI with a short payback period. Deploy Ampt optimizers with existing wires and combiners to increase energy production by recovering ~60% of system-level degradation losses caused by mismatch. 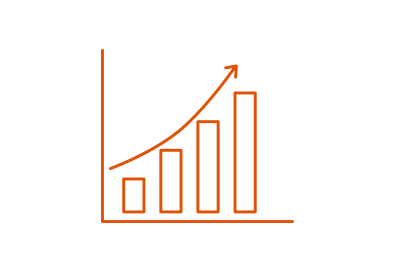 Ampt delivers significant ROI across a range of project conditions. 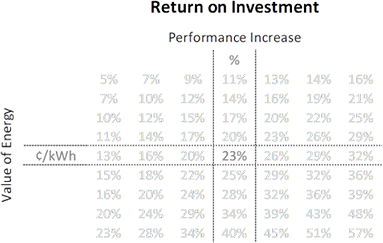 We work closely with you to understand and model your system to evaluate your ROI with Ampt. Connect one string to each Ampt String Optimizer input using existing cables. Connects Ampt output to combiner. Set inverter to constant or narrow-range voltage operation. 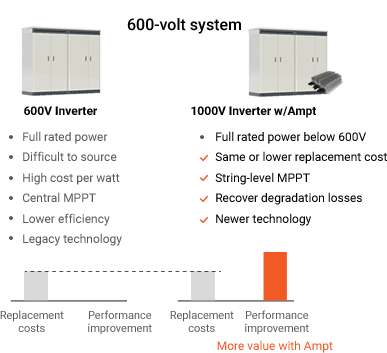 With Ampt, use lower cost per watt inverters and improve system performance. Ampt optimizers enable 1000-volt inverters to deliver full rated output power in 600-volt systems using 600-volt components to unlock value. 1000-volt inverters with Ampt can set their input voltage to a constant or narrow voltage range that is within their standard operating range and below 600 volts. 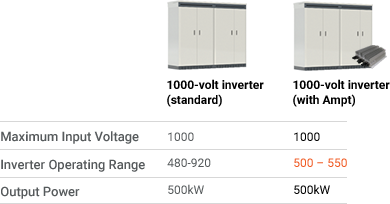 This allows the inverter to deliver full rated output power without exceeding the 600V maximum system voltage. 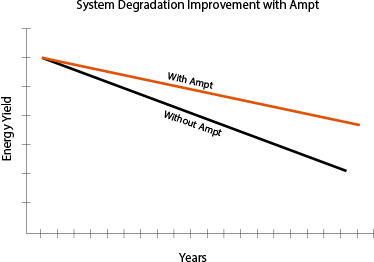 Ampt String Optimizers have maximum power point trackers on each input. The combined maximum power from each input is delivered to the output at a voltage set by the inverter. Additionally, Ampt optimizers have output voltage and current limits to ensure the maximum system voltage is not exceeded. With Ampt, system owners can take advantage of widely available 1000-volt inverters which have improved technology, higher efficiencies, and lower cost per watt compared to typical 600-volt inverters. 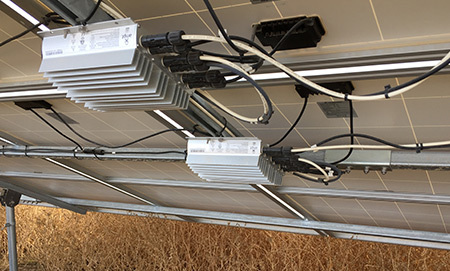 Adding more DC power with Ampt provides the inverter with more power for longer periods of time while staying within the inverter constraints to produce more energy and increase revenue. Ampt optimizers put MPPT on each input and deliver full power to the optimizer output by adjusting the output current to match the DC bus voltage set by the inverter. This means strings with Ampt optimizers can be added to existing PV systems to increase DC loading without creating electrical imbalances in the PV system that are present without Ampt. Ampt optimizers have patented output voltage and current limits which make it possible to deploy high DC ratio systems without overloading existing combiner boxes, cables, or inverters. 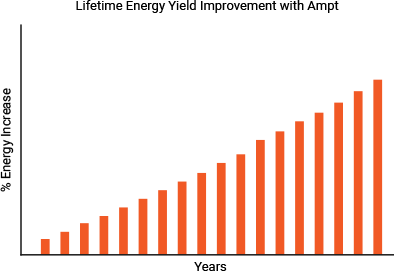 We work with you to determine how to optimize your loading ratios to generate more power and increase revenue. Energy Storage Systems (ESS) are rapidly decreasing in cost with new business models emerging to take advantage of PV+storage opportunities. 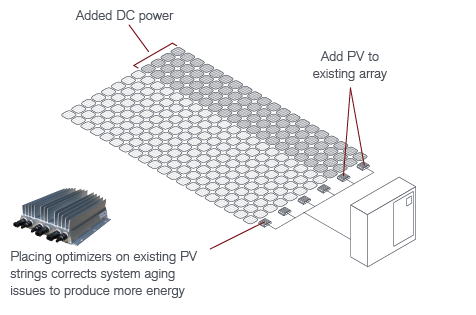 Ampt optimizers make it possible to add DC-coupled storage to your existing PV plant or hybrid system using a cost effective and scalable solution. 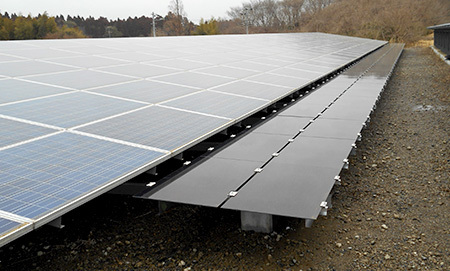 Learn how Ampt can repower your existing PV system to increase energy generation.